7 Mordekai: This chamber must be miles across! You dwarves are crazy! Why would you go to the trouble of creating an enormous excavation like this? 9 Mordekai: You live underground! The recent change to my site code to allow arbitrarily sized images has allowed me to do things like... this. I originally had this planned as a standard four-panel strip, but after I took the photos of the Hall of Dworin, I realised that to really do it justice I should do a slow pull back over several frames to the enormous shot you see in the middle. Moment to moment: Panels that show essentially the same scene from the same angle, but at small intervals of time. This can be used to show movement in a "slow motion" effect, or to mimic movie camera movements. The effect generated is one of setting up a mood. Action to action: Panels that jump between the essential action points of a scene, pausing to give the reader one shot of each relevant event. Subject to subject: Panels that jump between subjects within a scene, such as flicking back and forth between participants in a conversation. Scene to scene: Panels that switch scenes, skipping relatively large quantities of either time or space. Aspect to aspect: Panels that show different viewpoints of the same scene, at the same or an indistinguishably different time. These are useful to explore aspects of a static scene and, like moment to moment transitions, are generally associated with setting mood. Non-sequitur: I like peanut butter. The most common transitions in most comics are action to action and subject to subject, since they are the most efficient at telling a story and conveying the events. And like most comic artists, they're the ones I use most. Almost exclusively in fact. Conversations, upon which most of my strips are built, are prototypical examples of subject to subject transitions, and the (relatively few) action sequences I use are canonical action to action transitions. I also occasionally use scene to scene transitions, typified by the "Later:" or flashback "Earlier:" style captions that sometimes appear, and the scene changes between, for example, the Jones boys and the Nazis on either side of a gag. The changes from immersive fantasy or sci-fi world to me as the Game Master running the game could also be scene to scene, although from another point of view they are simply another example of subject to subject. Non-sequiturs are kind of hard to use as, by definition, they don't advance the story. You need to be even more experimental than I am (currently) to pull those off. Which leaves moment to moment and aspect to aspect. These can be powerful effects in a comic, but in order to explore their potential you need to have a large number of panels available. I have used moment to moment a few times, in strips like #127, #379, and #1052. But as you can see, it requires more panels than the usual four, and is tricky for me to do in my standard format. Which I've always felt is a shame, because it really does add to the atmosphere of the scene. 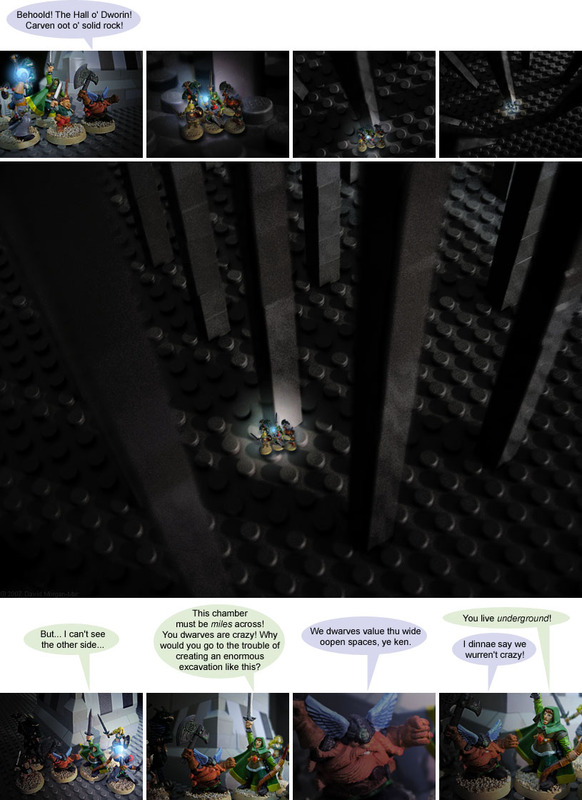 Enter the arbitrarily sized comic. 2016-09-14 Rerun commentary: This is one of my own favourite strips of all time, mostly for the visual impact, but also the joke isn't too shabby either. I reckon if making these comics was my full time job, a lot more of the strips would have this level of visuals. Last Modified: Wednesday, 14 September 2016; 03:11:03 PST.